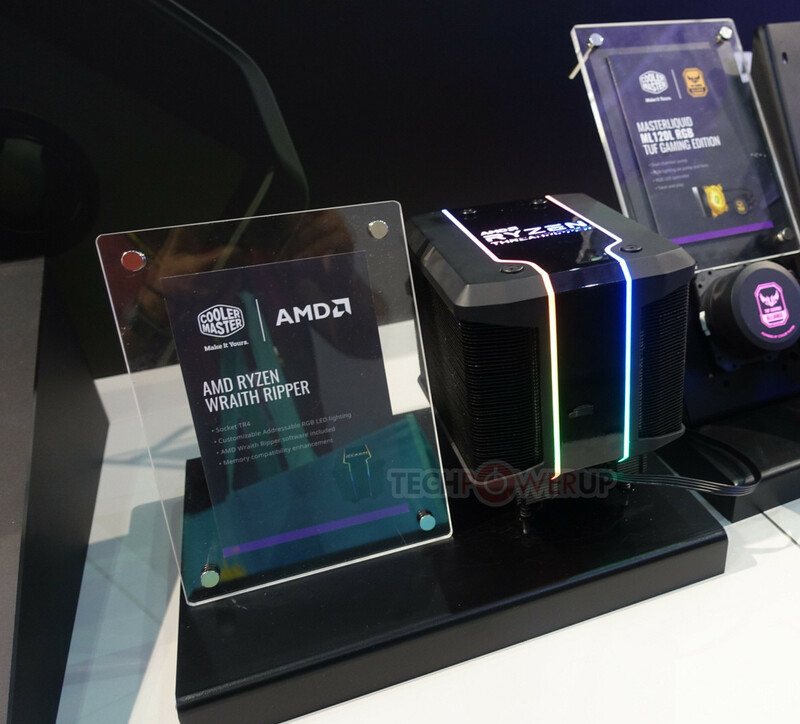 AMD has partnered with Cooler Master to deliver a Threadripper 2-specific cooler. 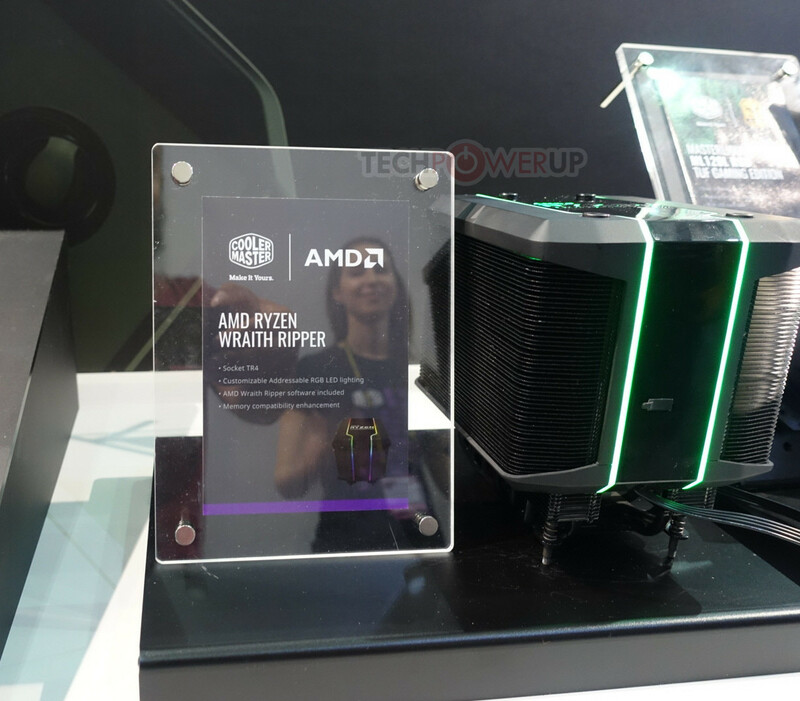 Dubbed the Wraith Ripper (as per AMD's Wraith stock coolers and their Threadripper 2, up to 32-core, 64-thread HCC CPUs), this is a behemoth of a mega cooler that can dissipate Threadripper 2's (perhaps the Threadripper 2990X's) 250 W TDP. The cooler features addressable RGB lighting that can be app-controlled, and Cooler Master says this cooler has been designed to offer full memory compatibility. The height between the baseplate and the heatsink's fins does seem tall and tidy for the tallest RAM sticks you can find, for sure - even with the eight pairs of heatpipes that drive the heat away from your most precious silicon component. 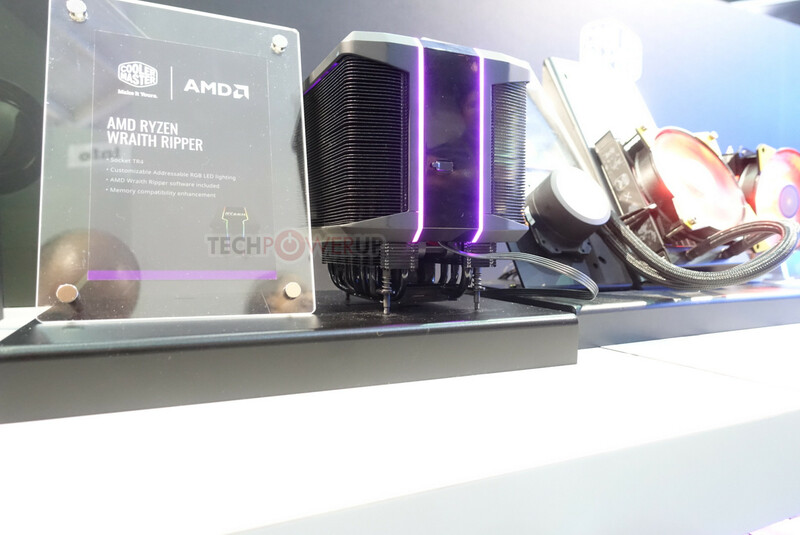 Check our COMPUTEX 2018 pics of this behemoth below. No way, that is nuts, what does it weigh? Surely something smaller, lighter AND more effective could have been devised. Put this besides what some use to cool a 95watt chip and your comments look even stranger , what please tell would you make. Is an aio smaller , perhaps a tec cooler, nope the laws of thermodynamics says big ,loads of cooling transport and area required. It's 32 cores we are talking about after all, I doubt they could do much better than that. Well, it's a good start. But asus has that awesome screen on their AIO now... with huge open space on top of that tower--surely they could be sending us commercials for video games or some other useful information with it. Unacceptable! Put a screen on it! Wow. Are there any other CPU coolers with 8 heatpipes on the market? I love it, but I guess you need to lay your motherboard horizontally so the board doesn't bend because of that big fat mofo. Or else there's a support for the back. But very neat I must say. Beautful looking cooler in contrast to ugly intel oem coolers. How does this not rip half the motherboard out? Either the motherboards are reinforced or you need to install them horizontally. But yeah, I was wondering the same thing. It appears to utilise only a single fan mounted in between the twin cooling fin towers, I would hope it has excellent performance to cope with the heat output from the CPU. 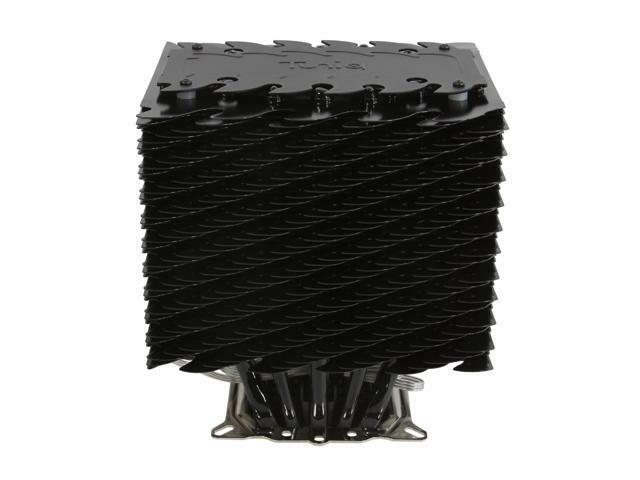 CoolerMaster's other TR4 cooler only has 6 heat pipes, but allows up to 3 fans and weighs 1.91lbs by itself. Well with this kind of heat you'd want very good case airflow anyway, so I don't see much of an issue. TR is not as spiky in temps as, say, recent Intel CPUs. I don't like RGB, but that's a nice looking cooler. Reminds me of the old Tuniq Tower Extreme I used on old AMD parts. Its size was also daunting, but it worked very well. Please commit a virtual suicide. What's so special about this? There has been large heatsinks for years already. Can vouch for this statement - Have a Scythe Susanoo here that's really only practical if mounted with the board laying flat, suspect this one would be about the same. This is clearly even larger than the Susanoo's heatpipe and block setup but it would have to be for handling the heatload it's supposed to move.